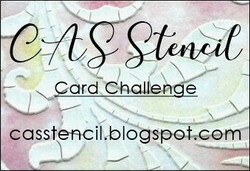 Today the A Vintage Journey May Challenge has posted. 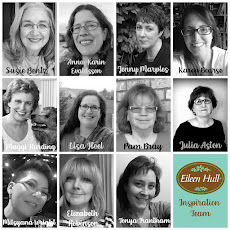 Alison is our creative hostess this month and her challenge is Words and Music. Here is her description of the challenge: For this challenge we would love to see projects that are inspired by our favourite song or that incorporate musical lyrics or sheet music in their design. Just remember to create your project in our preferred styles of vintage, shabby, mixed media, art journaling, industrial, timeworn or steampunk. 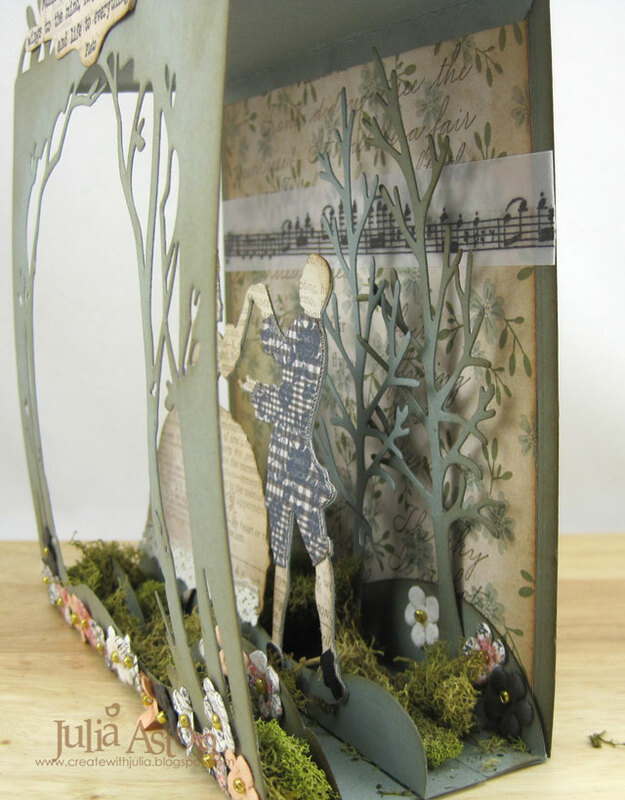 For my project today, I used a recently purchased Holiday Shadow Box die along with a Dancers Die. 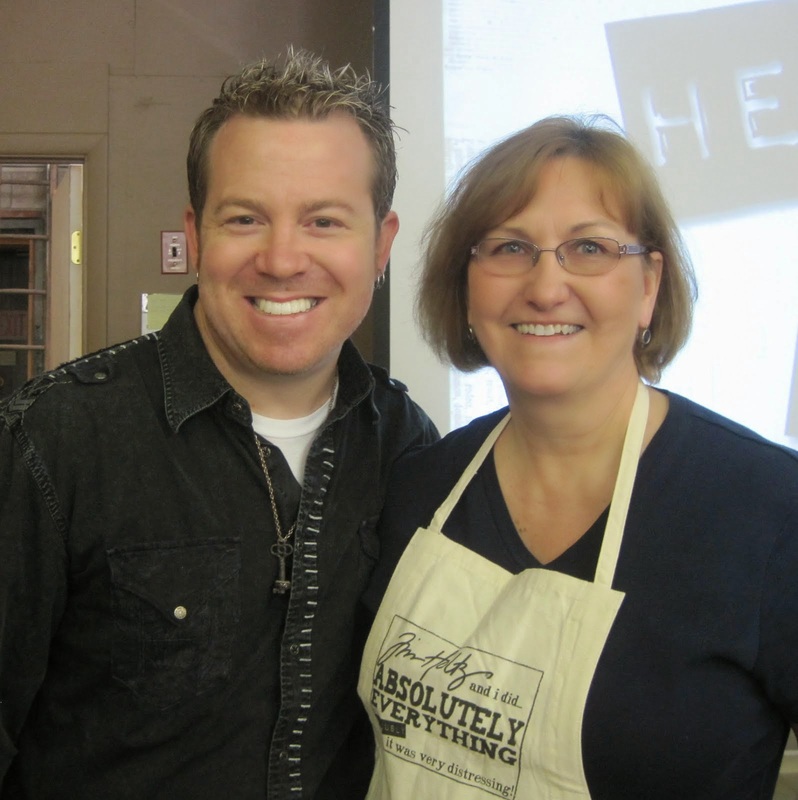 Both from Sizzix. 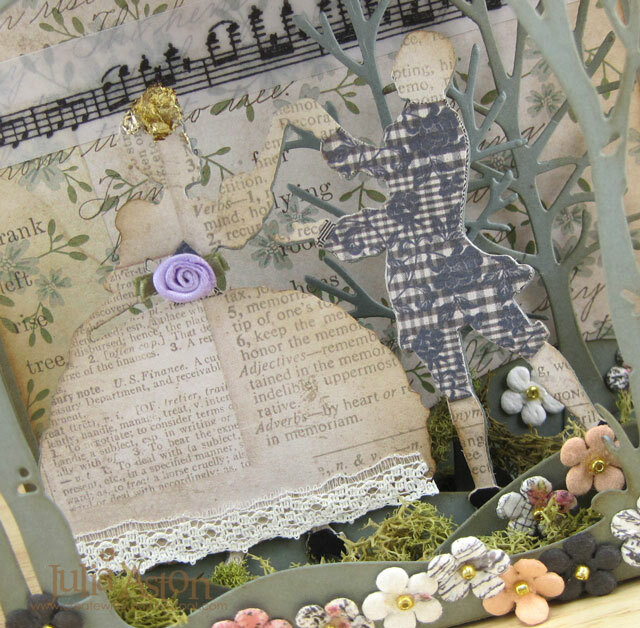 The lovely music theme sentiment quote is from a set by our own Alison Bomber - Set EAB03 from PaperArtsy! This die set with 3 sections allows you to create a fun dimensional scene. 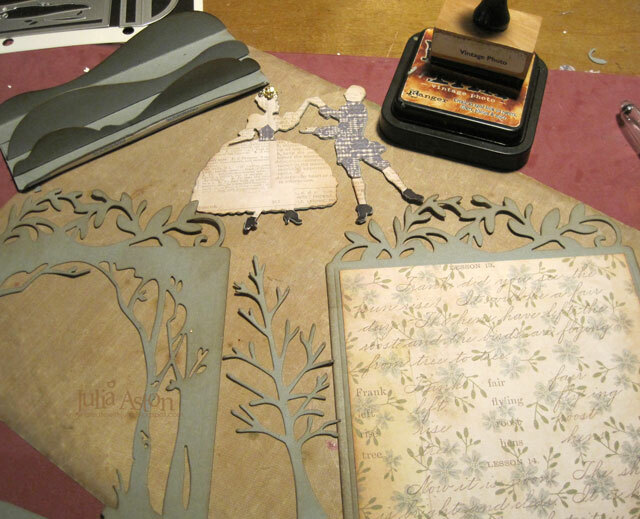 I added a strip of music to the background that I stamped onto vellum. 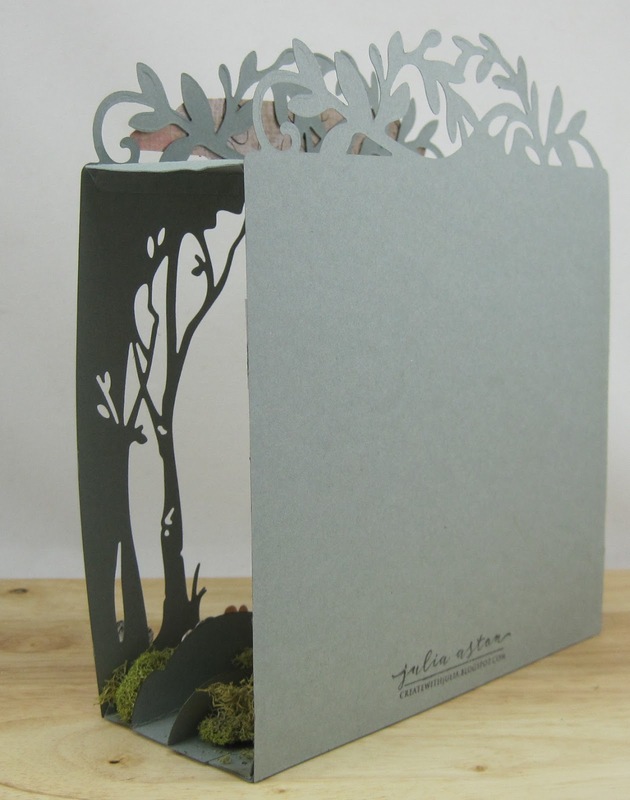 The whole thing is designed to fold up and fit into an A9 envelope, but I added dried moss to my landscape so that would make it too lumpy to fold!! I have just two photos of how I started making my creation. Then I sponged all the edges with Distress Vintage Photo before assembling the pieces. I die cut the Victorian dancing couple out of both card stock and text patterned paper layering the two to make them more sturdy. Then I cut out the gentleman's section again out of another pattern, cut just the suit area and layered it over him. I added a bit of gold leaf to the ladies head, a ribbon rose to her waist and lace at the bottom of her dress. I colored the couples shoes black with a Sharpie. 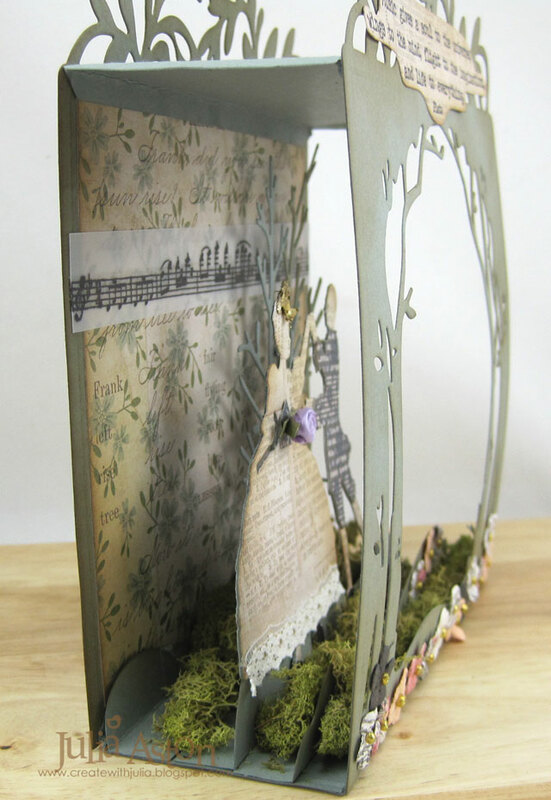 I added pretty little Prima flowers around the front and on the layers inside and I added dried moss for their dancing carpet out in this magical forest! How will music and words inspire you this month? We can't wait to see your creations. 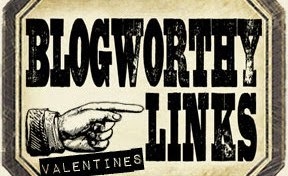 Please check out the lovely inspiration by the other Creative Guides participating in this months challenge over at A Vintage Journey! 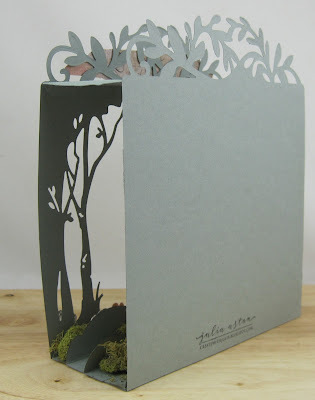 Paper: Stormy Sea, Vellum - Papertrey Ink, Paper Stash Dapper and Etcetera - Idea-ology. Ink: Ranger Distress Vintage Photo, Hero Hues Black. 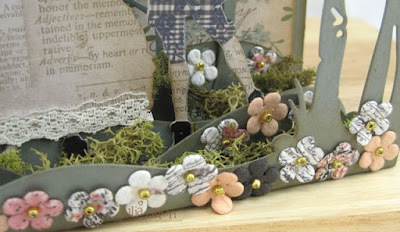 Accessories: Holiday Shadow Box Dies, Dancers Die - Sizzix, ScorTape, Tombow Glue, dried moss - Joann, gold leaf, ribbon rose, lace, Prima Flowers. WOW!!! What a stunning project Julia! Love the addition of the dried moss and the tiny flowers. Vintage dancing couple is amazing! What a super composition, I love all your attention to detail. A beautifully created scene. 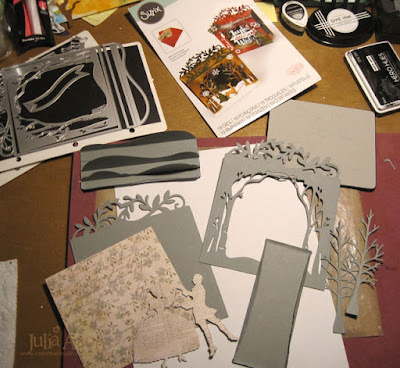 Oh Julia, - this is so cleverly put together, such amazing dies! This looks just fantastic and really has a Victorian feel to it, - love the addition of the moss, makes it look so real! 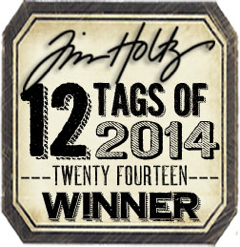 And of course Alison's stamps are the perfect finishing touch! Love the intricate die-cuts and you've created such an exquisite little scene with them - it's a theatrical and musical delight - with the perfect words, of course! This is amazing, Julia! Wonderful dimension and all the special details are amazing! I can almost hear that minuet playing! Fabulous creation! Love all the detail and the great 3D aspect. I am in awe of your talent and patience to create something like this! 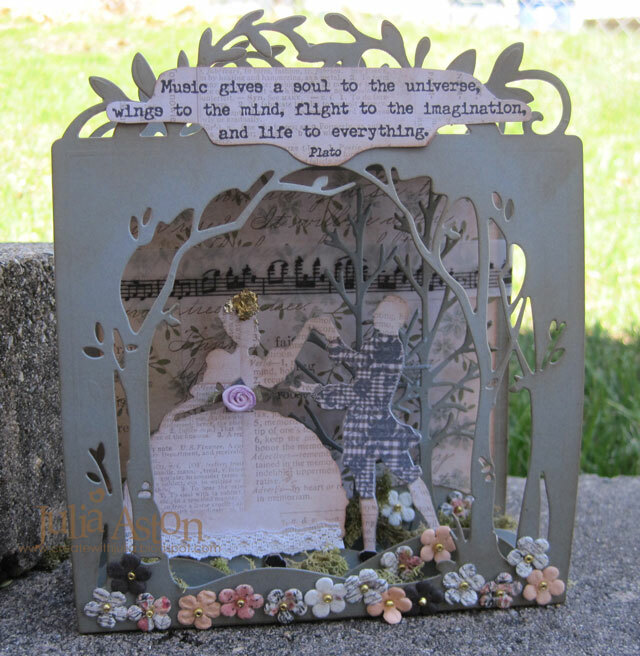 Julia, I love this Victorian vignette! What great dies and you have done a fabulous job of bringing them to life with your added touches! 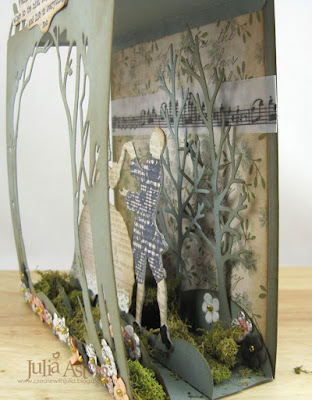 Great project for this month's theme at A Vintage Journey! Hugs!